When I was little, my older sister and I would compete to see who could hold our breaths for longer. She always won, and by a wide margin too, but it never bothered me much. My 8-year-old self didn’t think it’d be an important skill to come in handy, but, when trapped under water beneath a boat with stinging lungs, it’s the super power to envy, and I was envious on June 14th, 2017. River sports enthusiasts often like to talk about how rivers have immense power to destroy, but they also have equal power to create. Whether it be the memory of how a sunrise looks reflected on the curvature of a canyon wall, a new friendship, or an increased gratitude to be alive, I always leave a river with something more than what I had at first descended its banks with. This post, A Dark, Oxygen Deprived Place, is a reflection of both the destructive and creative power of rivers, and where the line between the two blurs. To give a little background, aside from being a river sports enthusiast, I am a dedicated conservationist. Three years ago, I was in high-school, and I started an independent podcast series about water conservation that I worked on in my freetime. I met many ranchers, water policy buffs, kayakers, and your average Joes in the process of making the series, and I didn’t want to stop connecting to river lovers or learning about water conservation. I caught the bug. Two years ago, American Rivers’ contracted me to produce and host their podcast series, We Are Rivers, a podcast project that takes listeners on a journey to tell the stories of rivers and the important relationships and connections they have with everyone, covering a wide array of topics across the Colorado Basin and country. The series is a way in which I give back to the wild and open spaces that offer me solace. At some point, we all must, (or at least should), give back to the places and spaces that light up our souls, whatever and wherever they may be. This post, among other things, is a call to action. Writing it was inspired by Episode 16 of We Are Rivers, “The Power of a Story,” in which we discuss how important sharing our own river stories are for the conservation movement. My most memorable river memory is not featured within the podcast, but it represents a pivotal moment that has added to my appreciation, reverence, and respect for rivers. If you have listened to Episode 4 or 5 of We Are Rivers, (“Beauty and Risk in The Grand Canyon and “Glen Canyon”) you already know how near and dear to me the Grand Canyon is. It is my favorite place in the world, a place where I have both seen incredible beauty and faced uncomfortable challenges. My most memorable river story comes from the heart of the canyon, on a three-week private river trip in 2017, tagging along with my best friend’s family. For those of you unfamiliar with water in the Grand Canyon, it is huge, with rapids ranging from an easy class 1 to a challenging class 10. The moment I will share was spent rowing a dory through a class 7 rapid (or, rather: attempting to). To describe what a dory is, for those who don’t know, is a daunting task. Dorys, to state simply, are wooden boats that have a habit of exploding on impact with rocks. The sound of splitting wood is heard by every serious dory man or woman at least once in his or her career. Some beaches in the canyon were quite literally lined with dory splinters. Who knows how far back the stories of each shattered piece–perhaps a gunnel, bow frame, or an ambiguous chunk–extend. Forever unknown and lost to the canyon, holy relics of their own now. By contrast, rafts are of a sensible design pioneered for the rational man or woman, made out of blown up rubber so that they can bounce off objects, and they rarely pop. On this trip, I was both lucky enough and unlucky enough to row a dory. 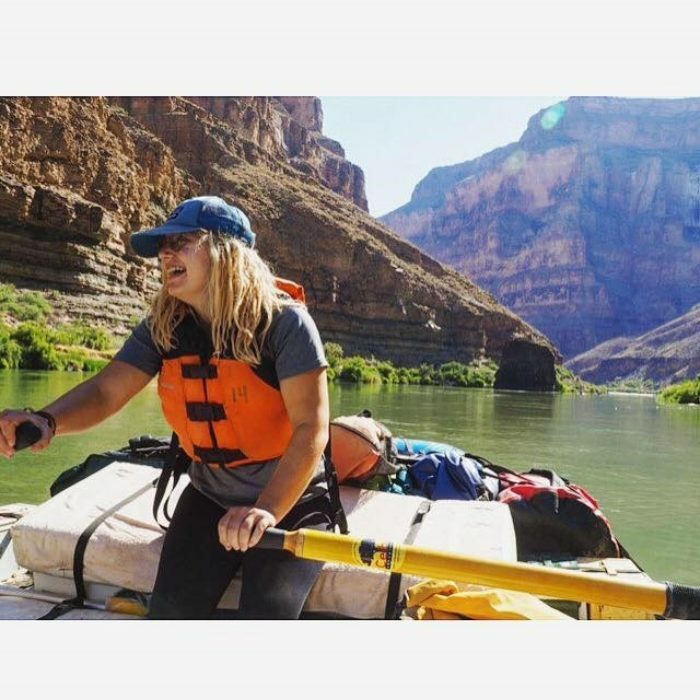 Lucky because when sitting in a dory floating down the Colorado River, there is a feeling of connection to the water so intense that it’s incomparable to any other craft except for maybe a kayak. Riding in a dory through a rapid as sharp rocks and cascading canyon walls swirl by, feeling every kick of the water and every oar adjustment, every moment is punctuated. But perhaps the most compelling aspect of the dory is its history. To be at one’s oars is to feel the poetry of the canyon, knowing very well that the original boats to run through were wooden and explosive, too. All the many stories that have floated through the canyon bubble up in one’s core. It carries a certain badge of honor, and it represents the age old struggle of the contending forces of past and present. No, the dory is in no way the rational boat to choose, but it is the most challenging boat, the most thrilling boat, and (for what it’s worth) the most poetic boat. And, as I would soon find out, the most humbling boat. I was unlucky to row the dory because I would only be rowing it for five minutes before its poetry turned to embarrassing carnage. On mile 209, the doryman of the trip, John, and I were naively relaxed because we had misread our mileage on the river, unaware that the bend ahead was about to reveal the last flippable rapid of the canyon that we’d face, a class 7. John, an experienced dory runner, planned to scout this rapid before he ran it. However, we didn’t know it was just ahead of us, and I was on the oars in only my third minute of rowing a dory, just beginning to figure out how it responded to my movements. A recipe for disaster. Hearing rushing water from behind the bend, we figured it was a small unnamed rapid. John and I exchanged a glance. “You got it, Annemarie, just steer clear of the rocks on river left.” He pointed to where some jagged rocks were beginning to show from behind the bend. I pulled river right. Then, like a shot of a gun, we suddenly bolted forward with increased speed and rounded the curve, revealing what was in store. On river right, there was a massive hole: a hydraulic feature created from water flowing over a rock and cycling back in on itself much like a washing machine. As the shock took over our faces and we grasped the weight of the situation, it was too late to switch who was on the oars. John yelled commands, “Pull river left! PULL, PULL PULL!” but as I pivoted the boat, it became clear that we could not cheat where the water wanted to push us. “Square up!” I started adjusting the boat for the impact. My adrenaline spiked and my muscles attempted to compensate, but when we still had 45 degrees left to align straight to the force, we hit. John lunged himself over the side of the bow in an attempt to keep us upright. It was futile. We went flying up into the air, and then in a movement not unfamiliar to dorys, our exposed gear flung randomly in every which direction as we flipped, a scene I hope was more poetic than it felt. My best friend and John were ejected from the boat, but as the boat whiplashed up upon hitting the hole, I was thrown back and hit my head, and landed upside down under the flipped boat, a dark and oxygen deprived place. My sandal was caught in the footwell above my inverted body. I crouched upward and ripped it loose and finally began walking my hands over the underside of the flipped boat, attempting to find its side for a way out. I wasn’t finding an edge and the temptation of inhaling stung my lungs. At this point, it had been less than 40 seconds without air, but seconds felt like minutes when adrenaline is spiked and your blood craves air. In the height of panic, I found an air pocket in the footwell of the boat and utilized it to choke up the water I had swallowed and inhaled as much as I could to regain logical thoughts. I heard my voices calling my name in panic, but they couldn’t hear me call back; my voice was weak and what sound did come out echoed within the dory’s footwell, inciting more panic within me. What’s worse, I knew there was a boulder on river right coming up downstream. If I picked the wrong side of the boat to pop out on, and if I had floated downstream at just the right pace, I could emerge to find myself between the rock and the boat. With enough time, I could swim out from between the two. But without enough time, I could get pinned between the rock and the boat. A fate that has rendered many broken up or worse. I ended up picking the wrong side of the boat, but I thankfully had enough time to swim out from between the two as John screamed, “Swim out! Swim out!” while he held onto the dory’s stern, a mad dash ensued that felt much more life-or-death than I’m sure it actually was. I can certainly say, I will never again misread where I am on a river. It is hard to describe the terror that rushed through my veins. From an outside perspective, knowing where the rock was in relation to our boat, and having access to oxygen, it might not have been as terrifying, but for me: it was the scariest thing in the world. A peaceful day quickly turned terrifying, struggling to find air. It was a sobering reminder of my place in the canyon. Despite the incredible fear and surprise from the flip, within minutes of being back on the water, I was back at the oars laughing –feeling the most electric and ecstatic I have ever felt in my life. In a 40-minute interval, I was the most terrified and the most joyous I have ever been, so incredibly thankful to breathe. It’s a gift to be alive and happy. Nervous, excited, and as in love with water as I had ever been, I rowed on. Despite regrettably drinking out of a friend’s size 11, 3-week-worn river shoe (a tradition inflicted upon those who flip boats), everything was cheery and lighthearted by dusk. And no, this isn’t my most memorable moment on water because of the fear, or the ecstasy, or the fact that it makes a story in of itself, but because of how incredibly cautionary and humbling of an experience it was. This is the most intense and scary event I have had on rivers so far, and (somehow) it has made me even more excited to be on them. It’s inspiring to be reminded of a river’s raw power and people’s love and craving to experience this power. I leave this canyon the closest I have ever been to a tragic scenario, somehow feeling further impassioned to get after adventures involving water. Perhaps this is why so many return to the river year after year, not for the comfort or for the luxury or pictures, but for the rawness of the moment and the uninsured outcome. This is incredibly grounding, checking our human ego and hubris, and now I at last understand the pull of the incalculable unknown.